So, this is a slightly stockpiled attempt from back when my mom was in town visiting from Pittsburgh. I was looking forward to her guiding me through the hard to stomach Annie Hall-inspired process of murdering live lobsters, and over the phone, she seemed game. But once she was here and I mentioned that I'd done some Internet research on lobster murder, using the word "roe" in the process, her face scrunched up in an unsettling way. It was as if I'd reminded her of something she'd sworn herself to forever forget. "Oh, Amelia. It's disgusting." Then, later, while we were at Whole Foods for pavlova ingredients, she held up a package of tails. "Can we just get these?" "No, mom! We need live ones for the attempt factor." "The majority of the meat is in the tails, you know." In the end, it was a matter of logistics. Too many things to do and the trip to Santa Monica Seafood fell to the wayside. First step, disappoint the lobster. 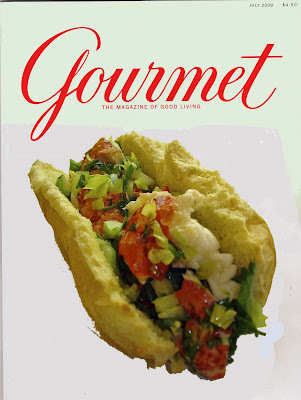 According to the online comments on Gourmet's site, this sans-mayo version of the lobster roll seems to have been a bit of a rabble-rouser. 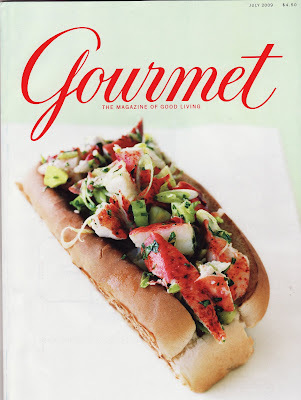 Instead of mayo, the lobster, celery, and parsley are tossed with an olive oil/lemon juice/salt mixture. And while I think it would have been delicious with mayo, once you've tasted this version, I don't think you can really argue with it. I mean, look at this guy. He's a total champion. I want to make these again!! !